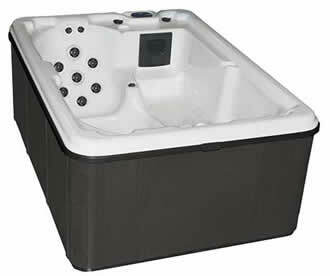 The Aurora I hot tub with a lounger and 2 seats, the shell is Soft Touch Slip Resistant Fortiflex™ HDPE and the cabinet is zero maintenance Vikashield™ the spa has 17 jets, under water lighting and a 2 speed 2hp Waterways pump. It’s been more than a decade since the traditional 5’x7′ spa has been affordable to consumers. Due to many factors within the industry the 2-3 seater’s cost became very similar with the more common 6’x6′ or even 7’x7′ spas. 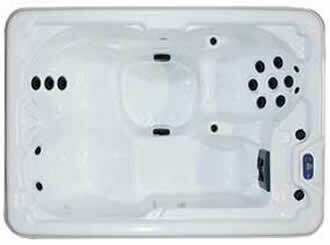 People then selected the larger spa even though a small intimate tub was originally desired. The NEW Aurora series from Viking is now a great selection for those couples or individuals looking for a more private tub at a great value!